A while back in A Different Hinge You Won’t Use I wrote about the ring/loop hinge that I found on three different munitions cases. 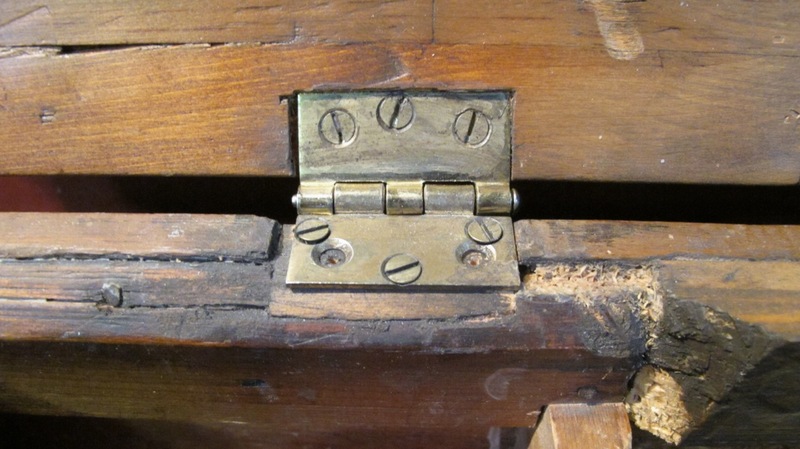 As is typical, I had never seen these hinges until I came across three of them in a relatively short period of time. Over two days I found three more examples in Asheville, NC this time all food related. Two in one shop. I wouldn’t usually write about more of the same if it weren’t for the fact there were more unique feature. 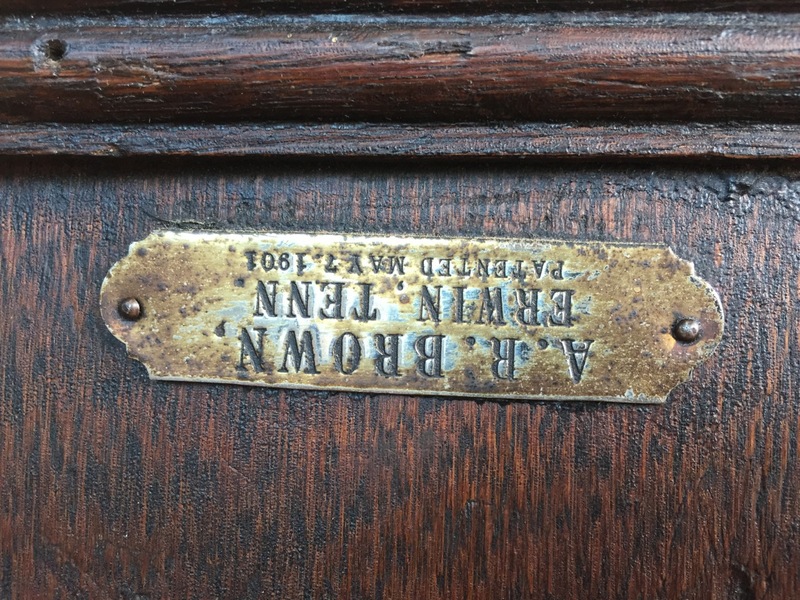 This is on the lid. And inset on the carcass. 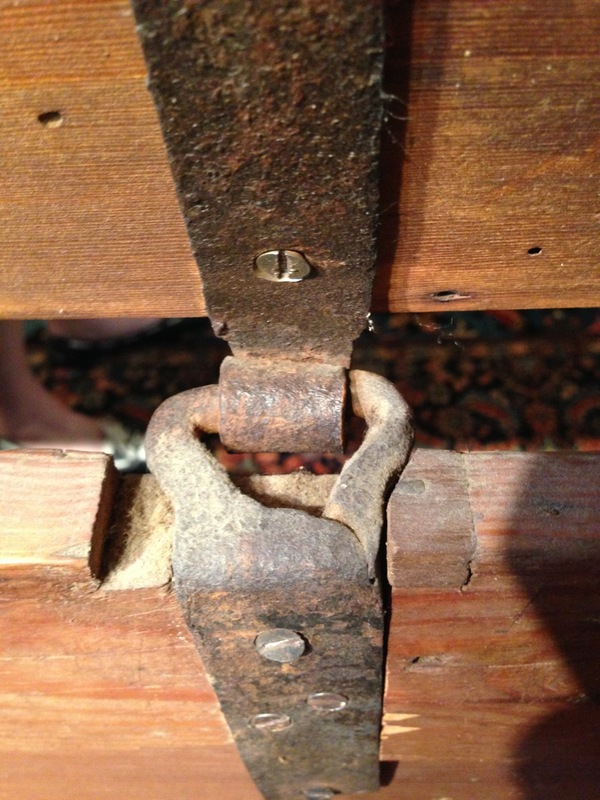 What is driving me crazy is that I know I have used a latch just like this. I have the sense memory of using it and recall how often you can release one side while the other hangs. Is there a legal definition of promptly? Only one wire in this latch. 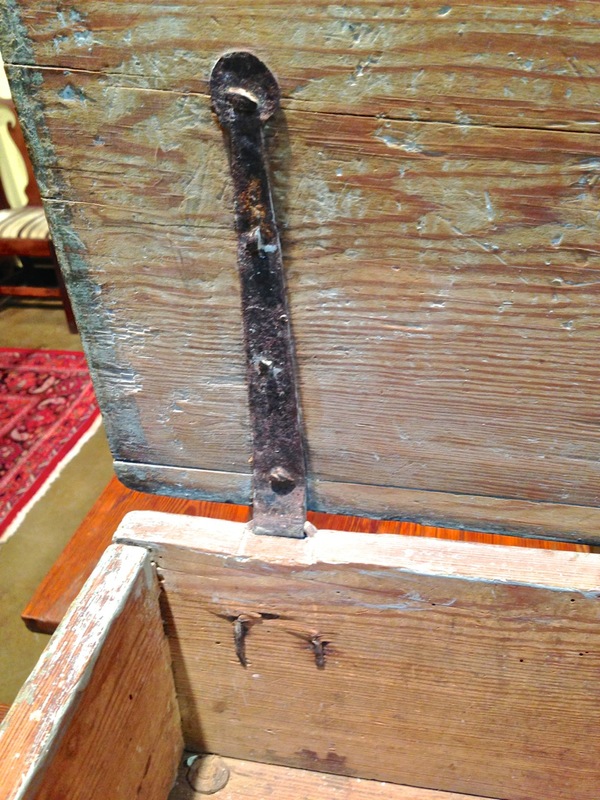 The inside of the crate is not well finished. I was having trouble trying to get a picture of the printing therein because of the texture. Can’t quite read due to the texture. 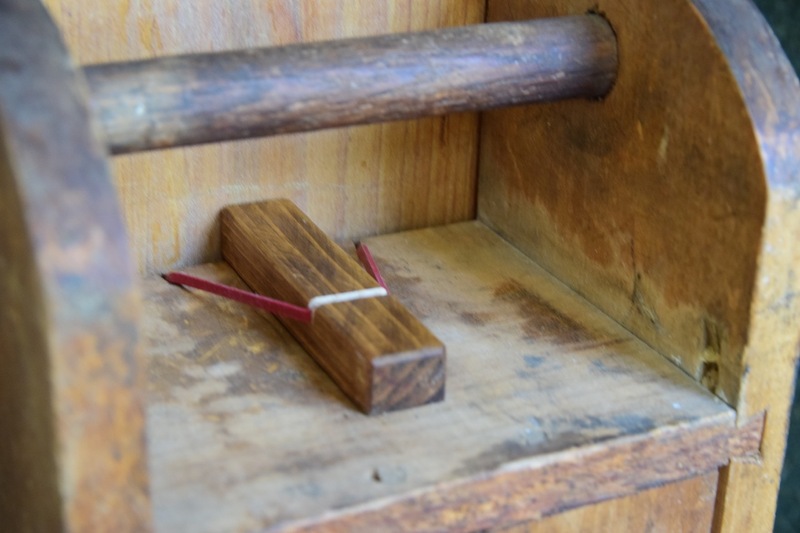 A nail on handle insert. 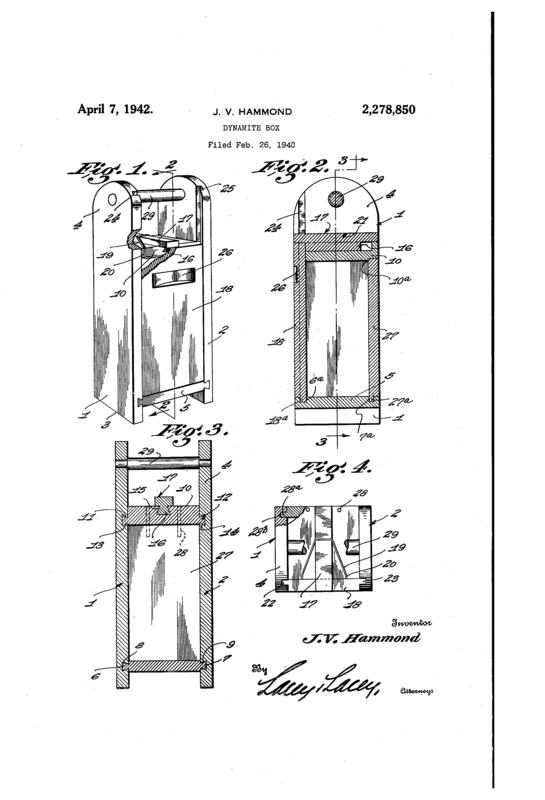 The function of the backing plate is unknown unless it is to keep fingers from being smashed by freely moving bottles. Or to keep the box sealed against our little insect or rodent friends. 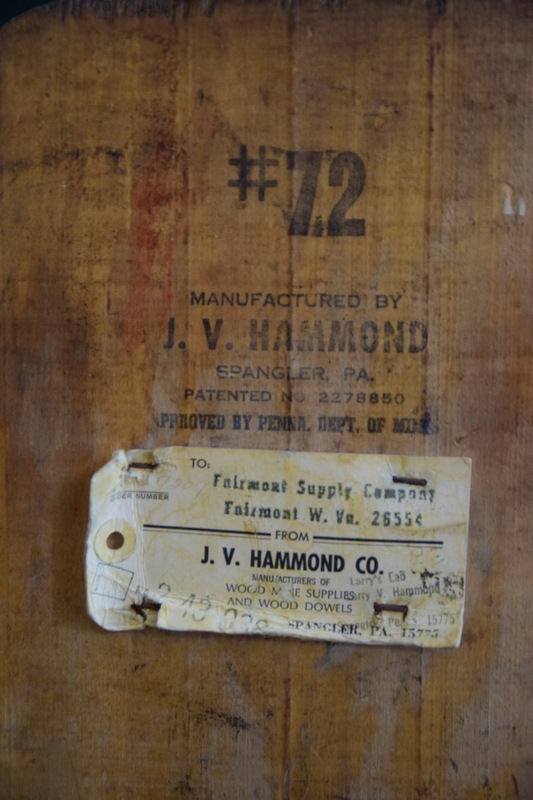 While poking about, I found an auction listing showing a similar box claiming the box was from 1919. I also found an obituary in the July 17th, 1934 Chicago Tribune for a Douglas Monroe Goodwillie, 38, who died suddenly of heart disease. A newer, bright shiny box. Joinery seems to be nailing strips at the corners. This box looks more like a promotional item than a shipping container. 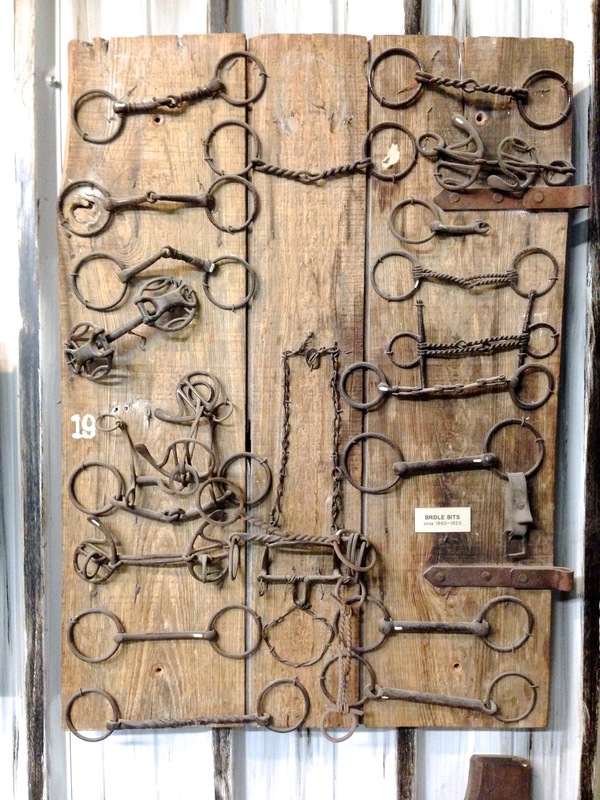 Bright, shiny familiar hinges. 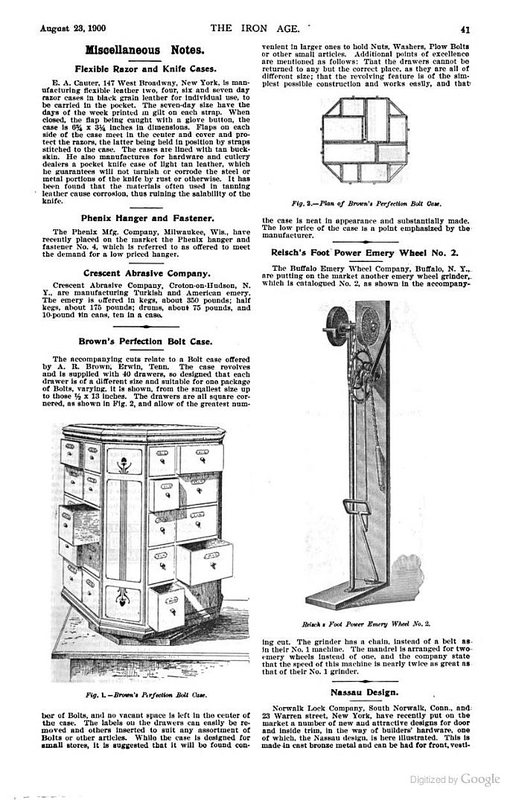 Made by Hager, a maker of many types of hinges. Ring/loop hinge looks the same except for the shine. 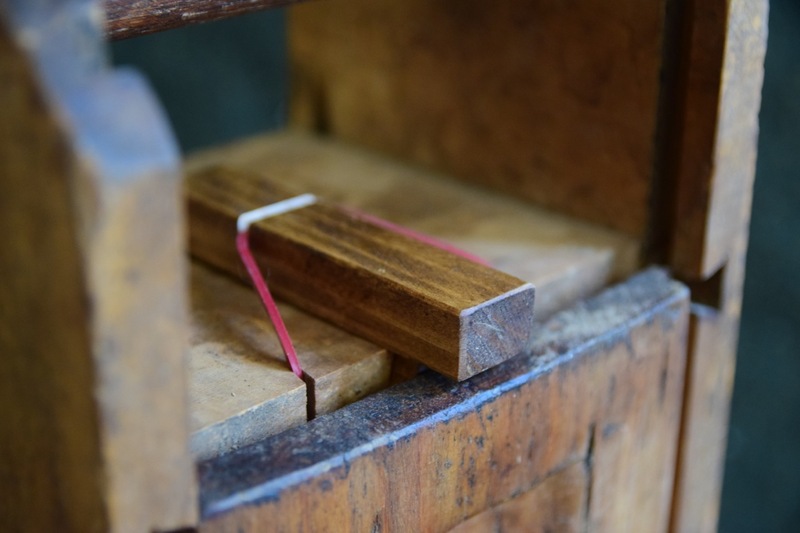 Another box with nailed-on joinery. This box also seems to be more promotional than functional. From our favorite multinational consumer products company. Now that I’ve beaten this topic to death, we move on. It’s been a while since I did a binge post. I feel the need for another hardware binge but there have been too many pictures since the last binge. To keep things manageable, I decided to break them down by type. 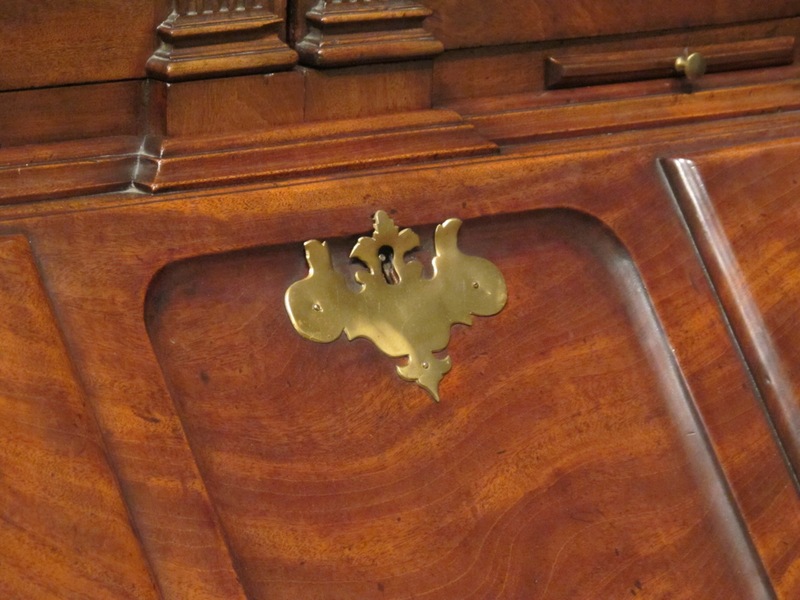 Today we will see glass pulls or knobs if you prefer. Not much else to say. They are glass. They are pulls. They are HERE. 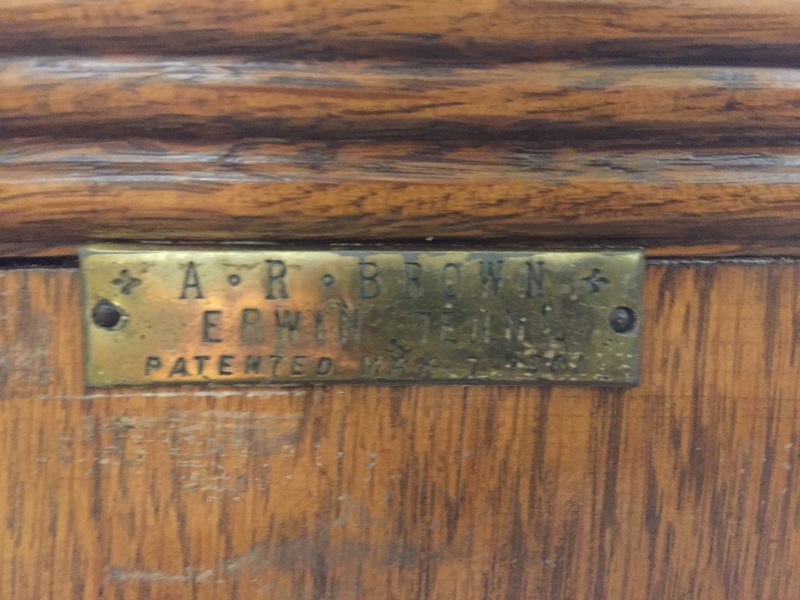 A. R. Brown Gets Around. Or at least his cabinets do. This is another case of finding three related things that I had never observed before in a short period of time. They were probably out there but I didn’t notice them. And I usually check out labels. No, my ego tells me I never saw one before. 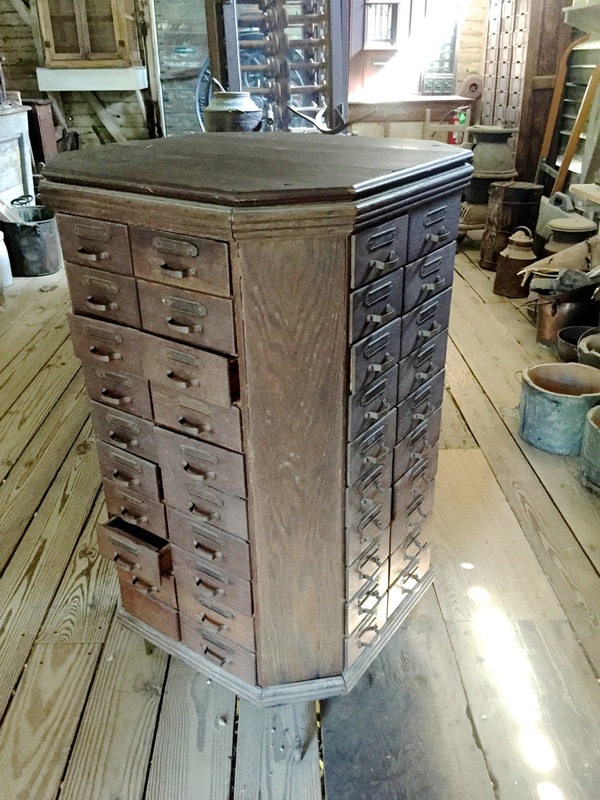 A forty drawer, revolving, octagonal cabinet. 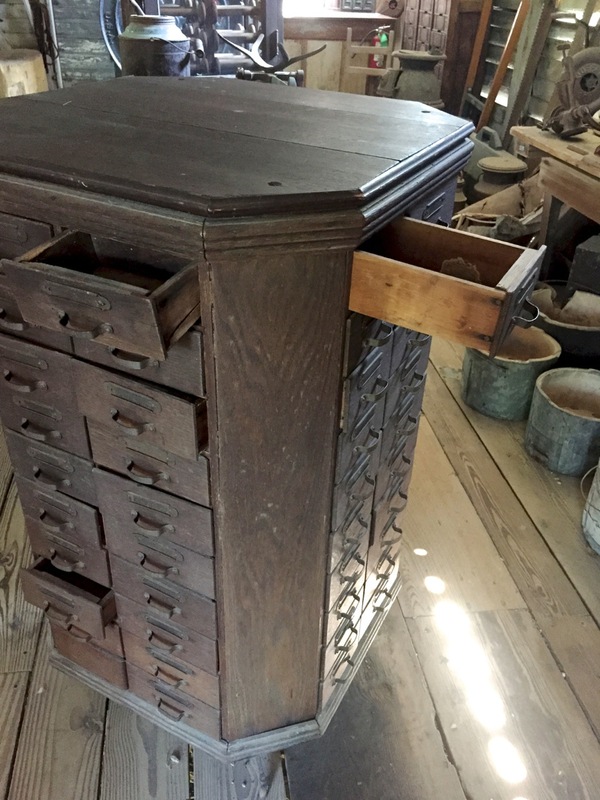 Drawers on opposing sides are half the depth of the cabinet meeting in the center. 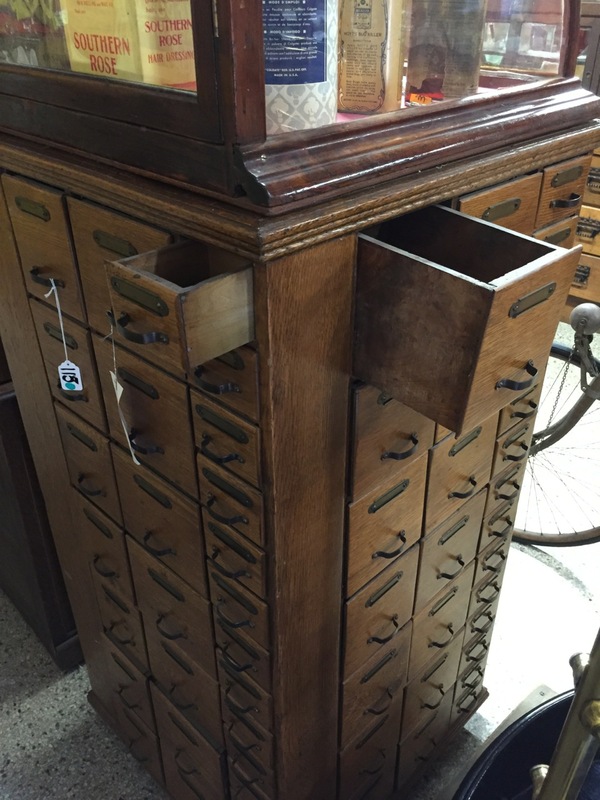 Drawers on the perpendicular sides depth is limited by the longer drawers. Only upside down. Looks like is always been upside down. 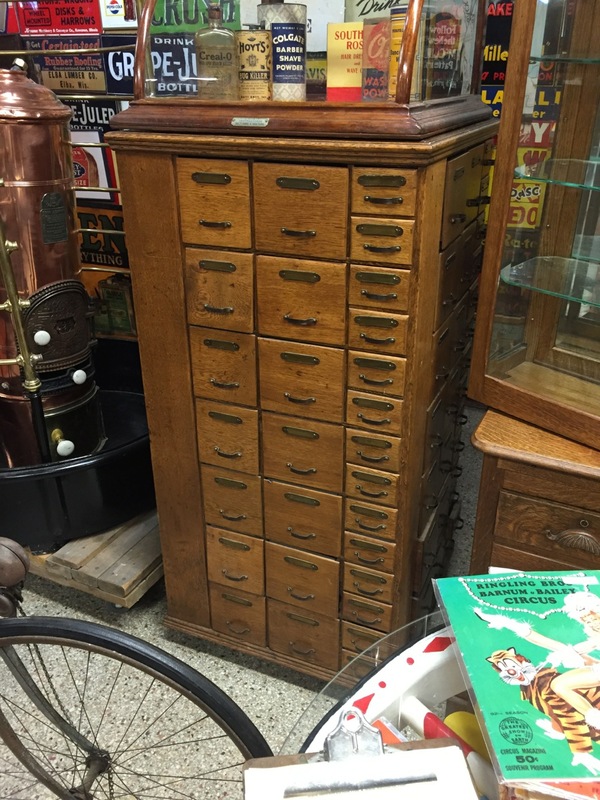 Same drawer design but twice as many. You can read this one. Squaring the octagonal allow another four columns of drawers to be added. 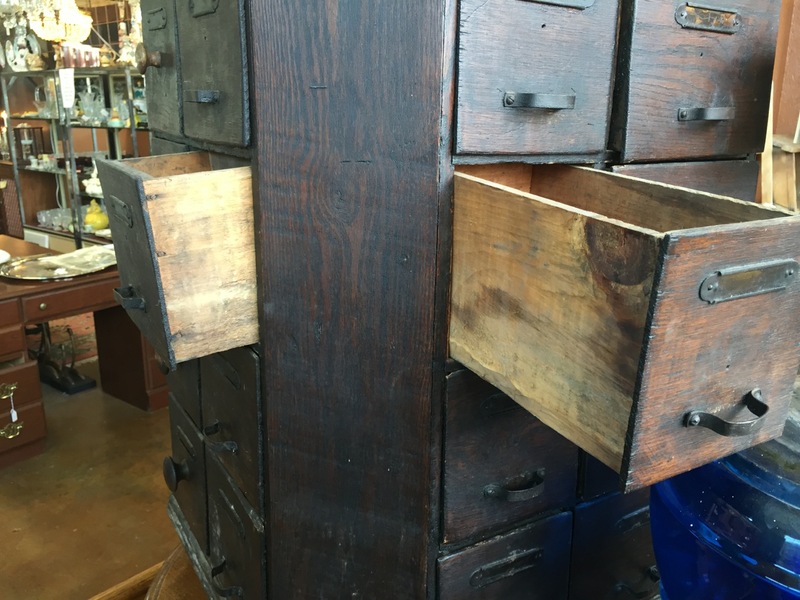 Drawers are of different sizes on all four sides. 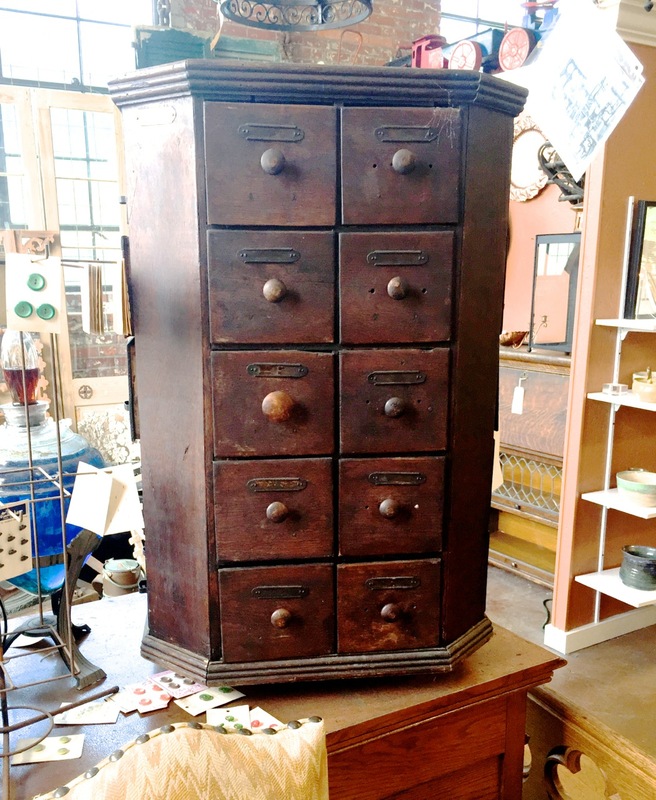 Click here for an eBay listing of a similar cabinet with more pictures. Same text, squared off shape with decorations. A. R. (Albert Rosencrans) Brown was an interesting character, entrepreneur and civic leader. Brown was born in Knox County, Tennessee in 1863 and was orphaned in 1865. 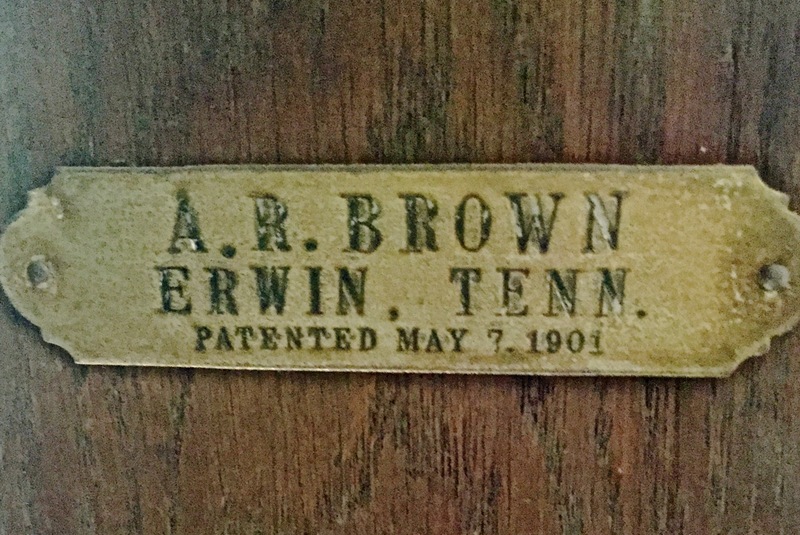 In 1894, he arrived in Erwin, Tennessee, where he opened a hardware and mercantile store, A. R. Brown and Company. He organized and was president of the First National Bank of Erwin; served as president of Unicoi Bank and Trust Company, Erwin Water Company, Erwin Manufacturing Company, Erwin Cemetery Company, Erwin Inn Corporation and Unaka Academy; served as secretary-treasurer of the Erwin Development Company; served as vice-president of Unicoi Telephone Company. He died in a traffic accident in 1937. From a Google Books scan. 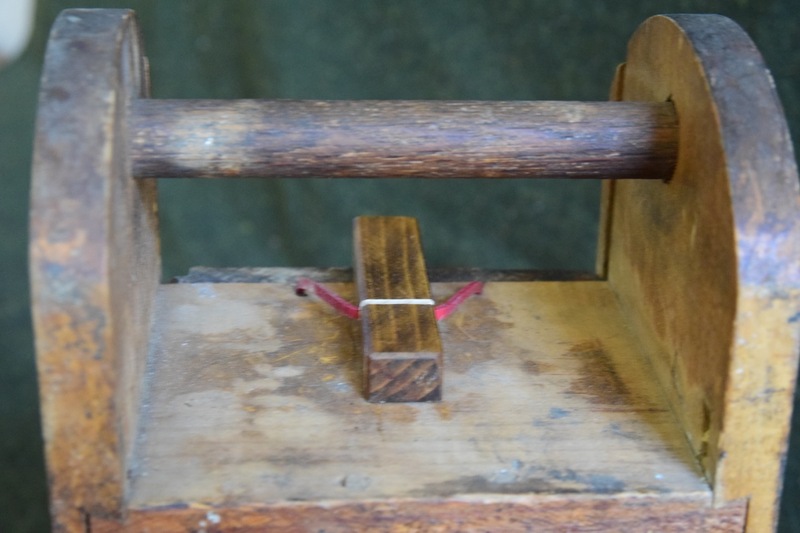 I have written a few blogs about bodging and being bodged. My most favorite were My Mother was a Soviet Bodger and Teenaged Mutant Ninja Bodgers. Bodging as I use it means doing what must be done to make things work the best you can. Often modifying hardware to make it work. Not the prettiest mod ever. 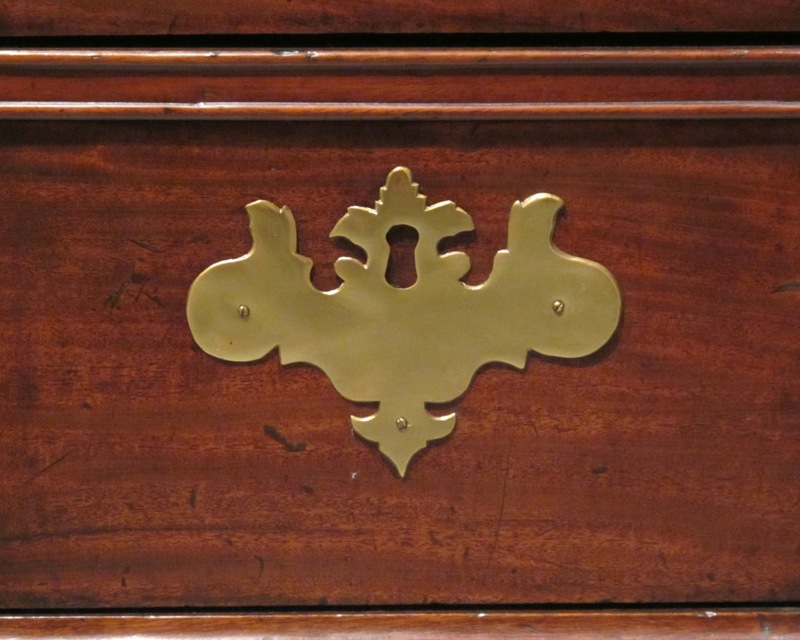 Last week, I saw a chest that had escutcheons that seem to be designed to work either way. 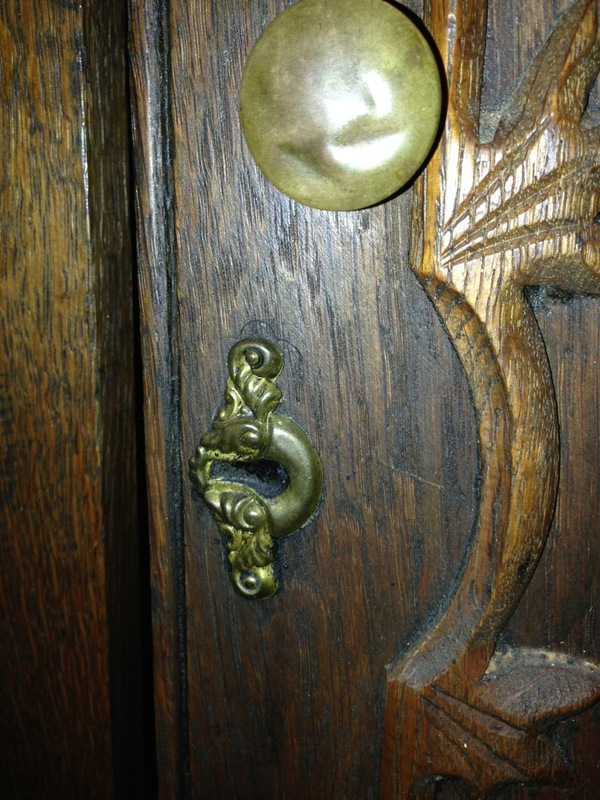 This is an escutcheon used with a bail. 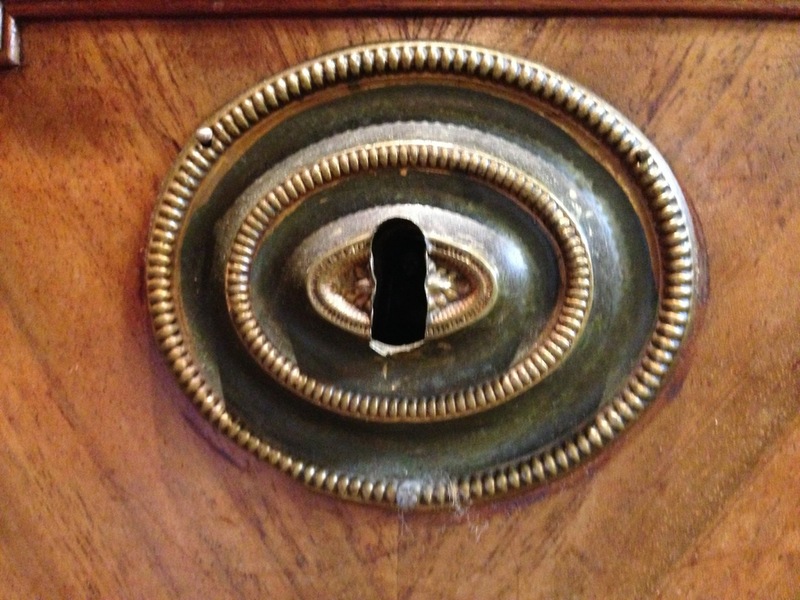 Note the outline of a keyhole. Was it a knockout or were tools required? It works. 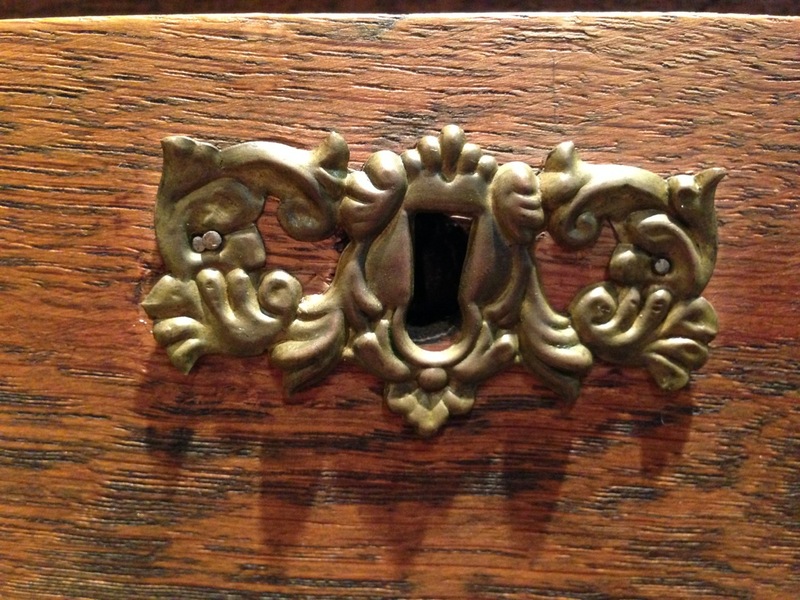 Keeps down your escutcheon inventory. And it looks better than just banging in a hole. 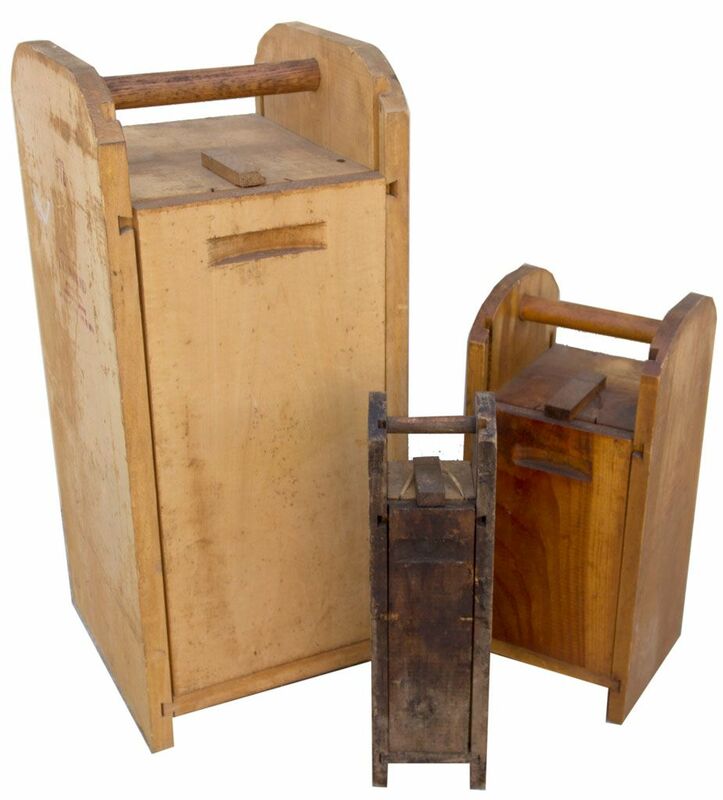 Nathaniel Gould Was Not a Bodger, He Fitted Skillfully. Today I visited the Peabody Essex Museum in Salem, Massachusetts. 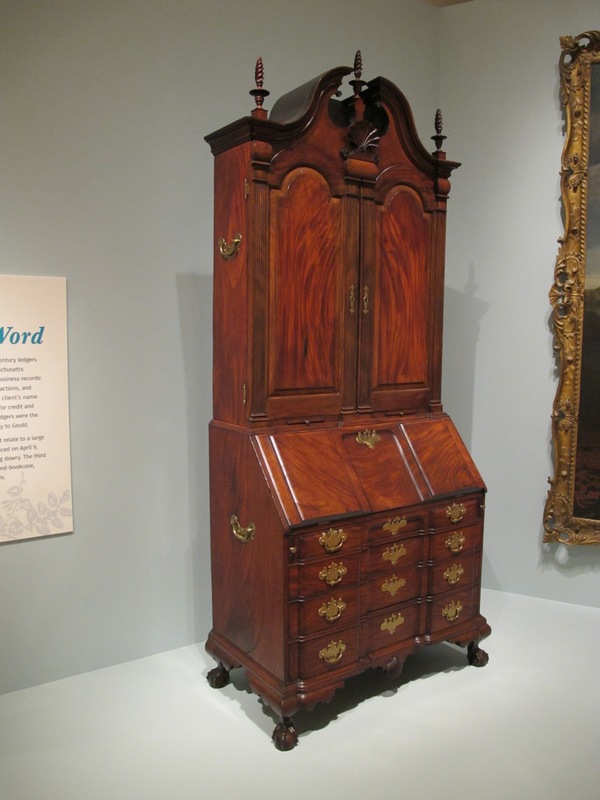 The main reason for going was to see the exhibit: In Plain Sight: Discovering the Furniture of Nathaniel Gould. 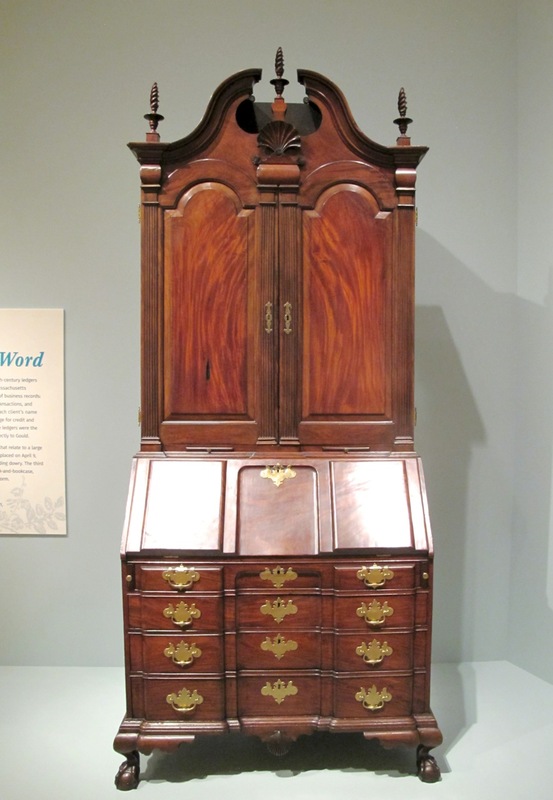 Chuck Bender wrote about this exhibit in September on his late Popular Woodworking blog. I went and am now in the dog house. I picked this weekend based on the fact my wife and a group of our friends were going to the beach on Emerald Isle, NC. It is a beach house that has by rented by our group for six of the past eight years. Problem is I don’t love the beach as they do. I grew up in Western Pennsylvania. We didn’t have beaches. They go to the beach, I go to Boston. Seems fair. Now the bigger problem is that my wife’s work schedule changed and she isn’t able to go to the beach and I still went to Boston. The airplane tickets were non-refundable. At times the word conspires against you. 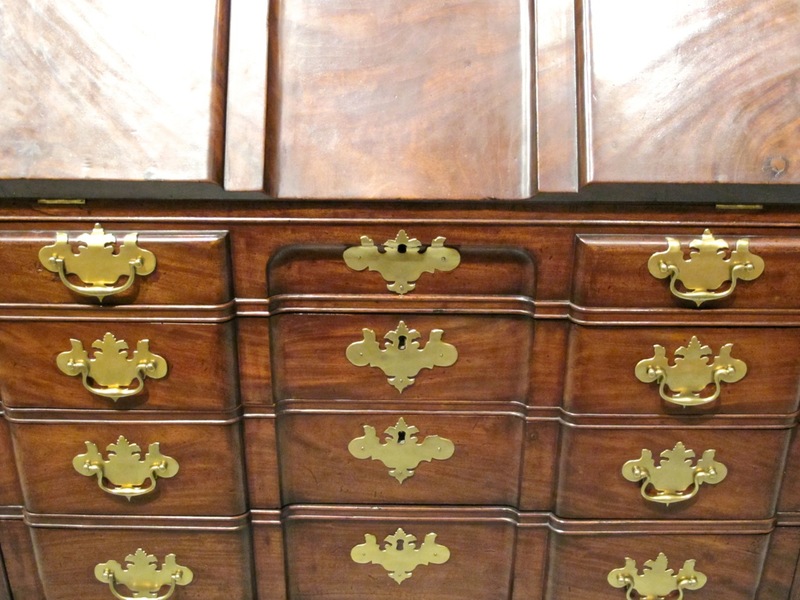 Back to the woodworking content of the blog. In February, I wrote the blog Bodged, it’s not what you think with a follow-up last Friday, They Did It the Hard Way, Bodged II. This is not bodging, it’s custom fitting. 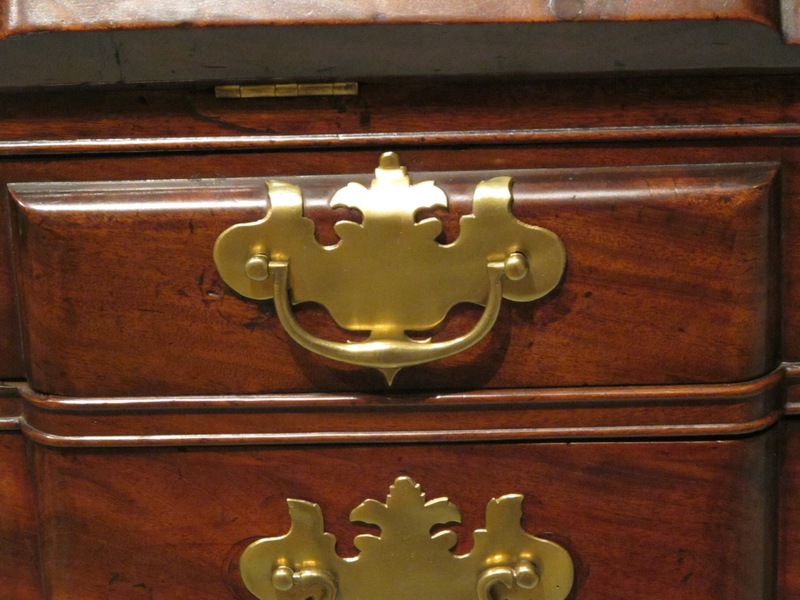 I took a look at the brasses and saw they were not all lying flat but some had been well fitted to the slant front and drawers. Well fitted into the recess. And over the block front. Not fitted but no lock either. Somebody in the Gould shop was highly skilled. 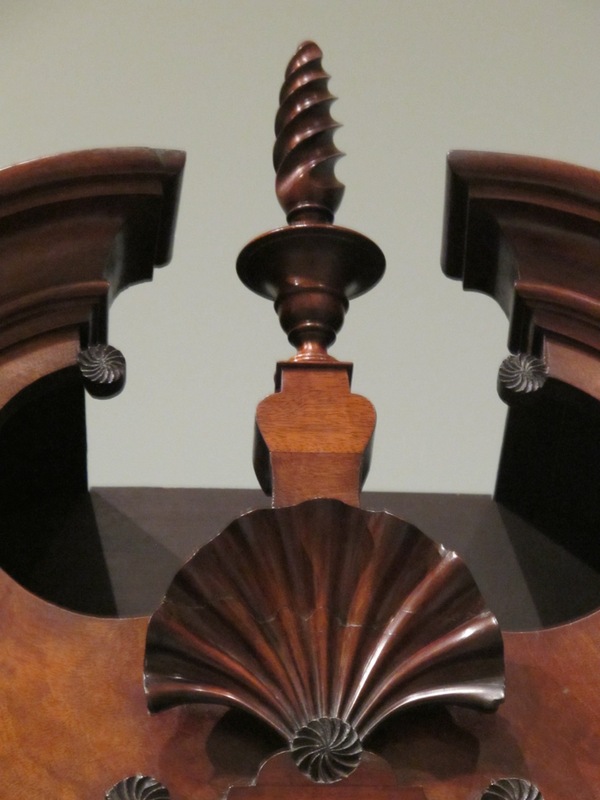 Oh, what the heck, the top shell and finial are interesting, too. A broken arch pediment with shell and finial. 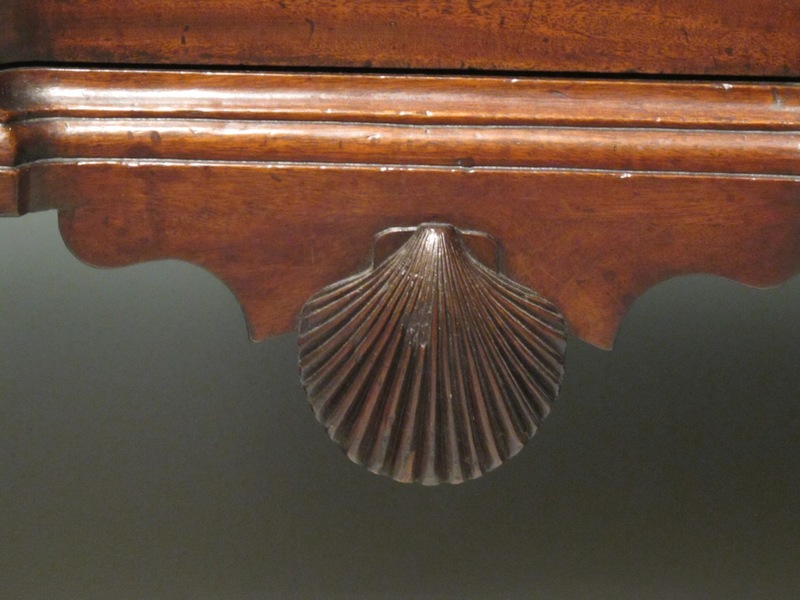 They carved interior and exterior shells. Only time will tell how much trouble I’m in. Probably not all that much. I have a truly understanding and tolerant wife. I do. Really. 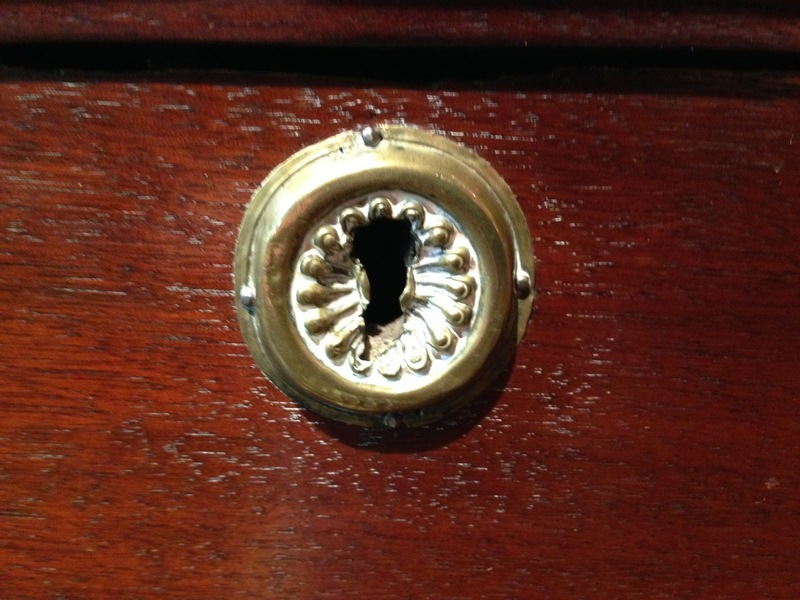 Way back in February, I did a blog on bodged items. (See it here at Bodged, it’s not what you think.) The definition I used was essentially just doing what needs to be done to make it work. Maybe not pretty but functional. I have found a few new example I want to share. Why, because it’s what I do. 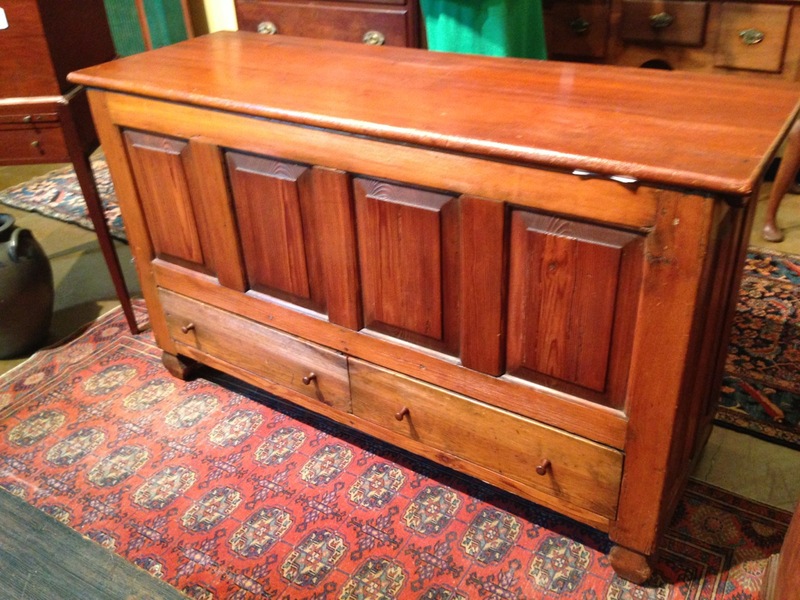 Most of us would addressed the stripped out wood. 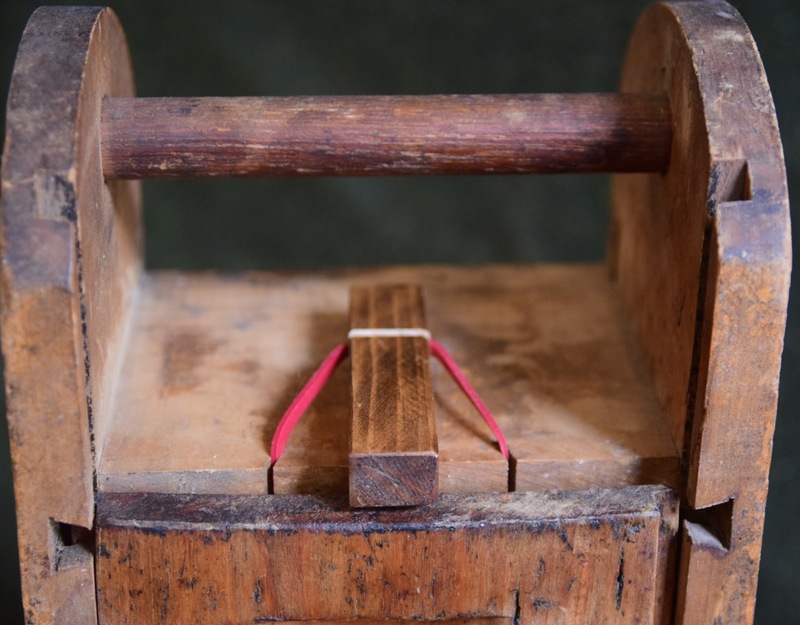 The average person might use the “toothpicks and glue” technique to reinforce the hole. 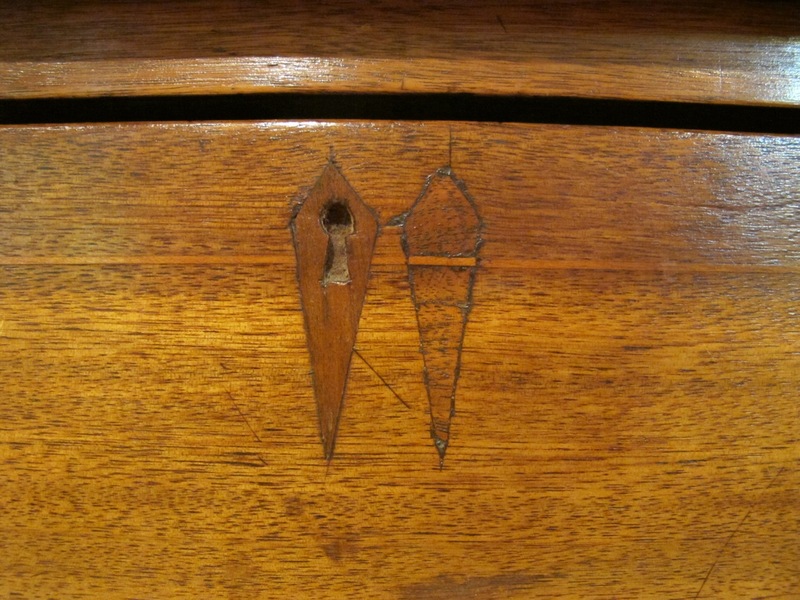 Others might drill out the holes and use long grain plugs (but not a dowel). 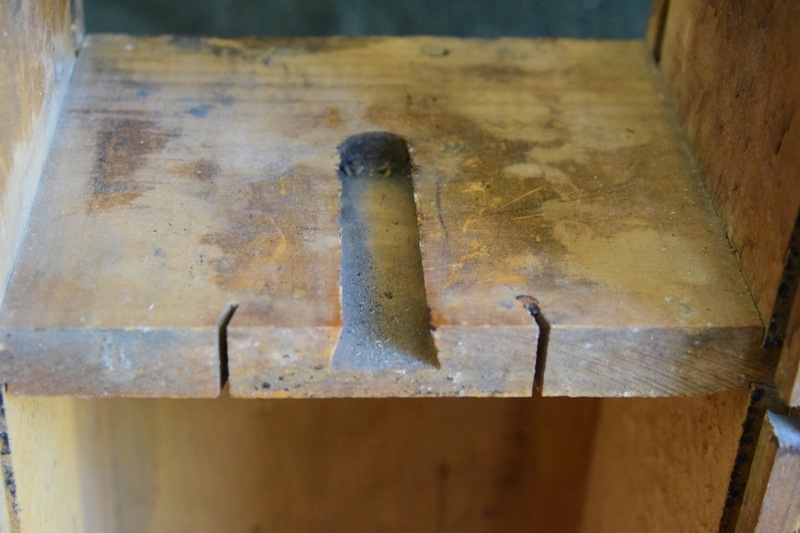 They chose to drill and countersink new holes on the hinge. Dang overachievers. Technically a very well done repair. Not as designed but it works. Who decides what up is? Who ordered the wrong lock? I can almost believe this one was made this way. Hard to say. And that’s all for tonight. I’m exhausted. If you are a genteel person with a sensitive nature, you should leave now. Some might find this topic shocking, not in the Howard Stern or South Park sense. More like the stereotypical maiden aunt from Dayton expectation of shocking. If you are still reading you either are a curious person or don’t have a freakin’ clue what I am blathering on about. Whatever your reason, read on. I have seen the following item in the men’s room of several higher-end restaurants and bars. I’m not sure if it’s a hipster trend or there is just a really good salesperson out there catering to all the right places. Well, here goes. It’s got a handle. Click for a larger view. Really? This looks like the Kohler White Stronghold® Elongated Toilet Seat With Integrated Handle and Self-sustaining Check Hinge, $28.46 street price. Available in Almond, Black Black and Biscuit at slightly higher prices. Is this a growing niche market? There are many similar products including add on handles called Nifty-Lifty and Flipsit (Antimicrobial) and a foot powered lifter. There are a lot of really odd products out there related to toilets that I hope to forget once this blog is finished. There are some things you can’t unsee. Research takes a toll. I asked my wife if there are similar things in the women’s room. She shouldn’t recall. 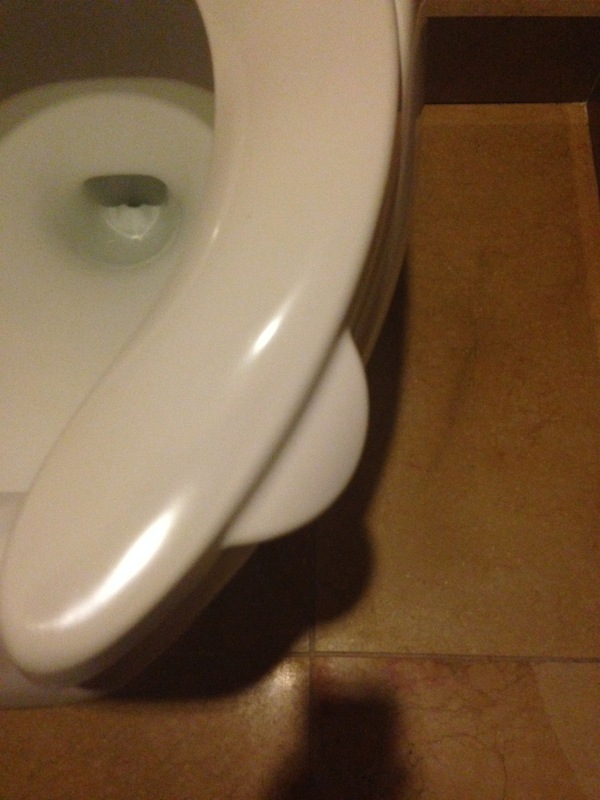 In fact, she couldn’t say if the toilet seats are open front or closed front (horseshoe or oval). Part of me is glad. We don’t need two overly curious minds in the family. I will just need to do research on my own. 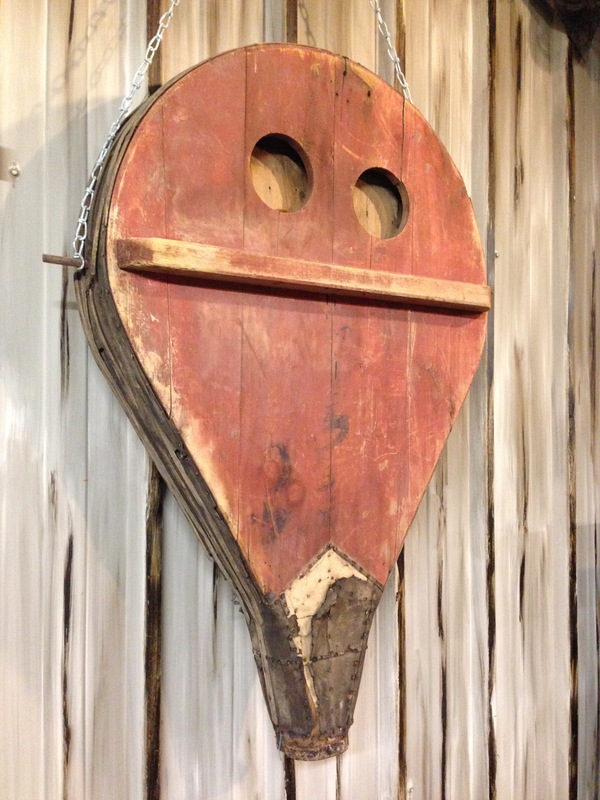 There’s a lot for the ferrophile (iron lover) at the Rural Life Museum in Baton Rouge. 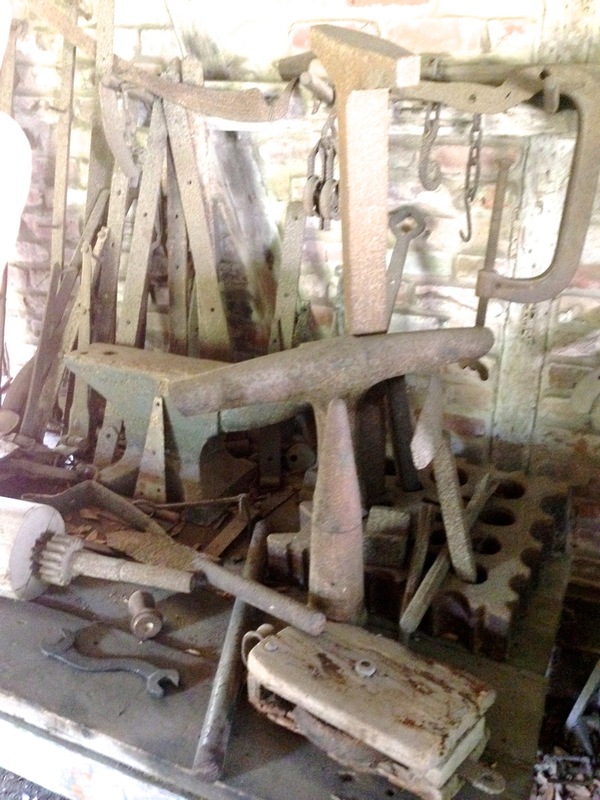 There are manufactured products, furniture parts, house parts, and a blacksmith’s shop. It took a while to decide how to sort the images since they are throughout the entire museum grounds. 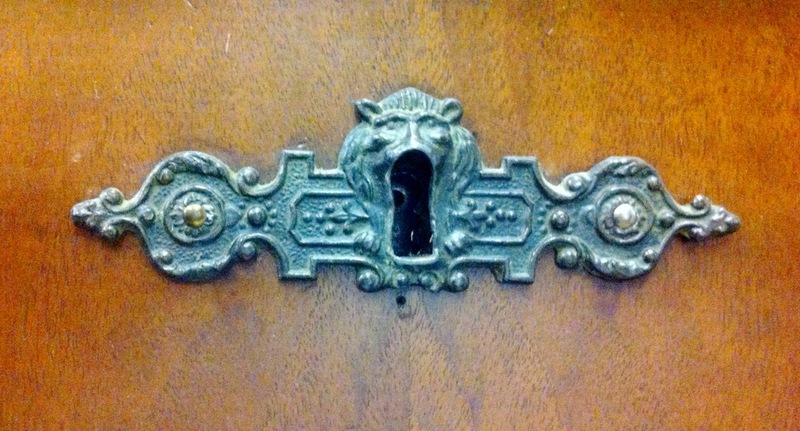 All sorts of interesting hardware in and on the buildings. Many of the buildings are from the same plantation so it would make sense that they may be of similar design and construction. 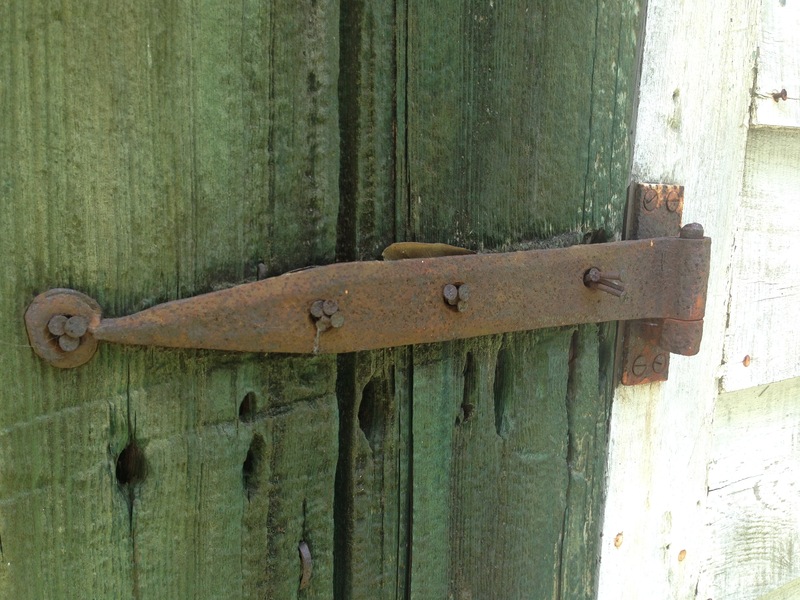 One of many pintle hinges. 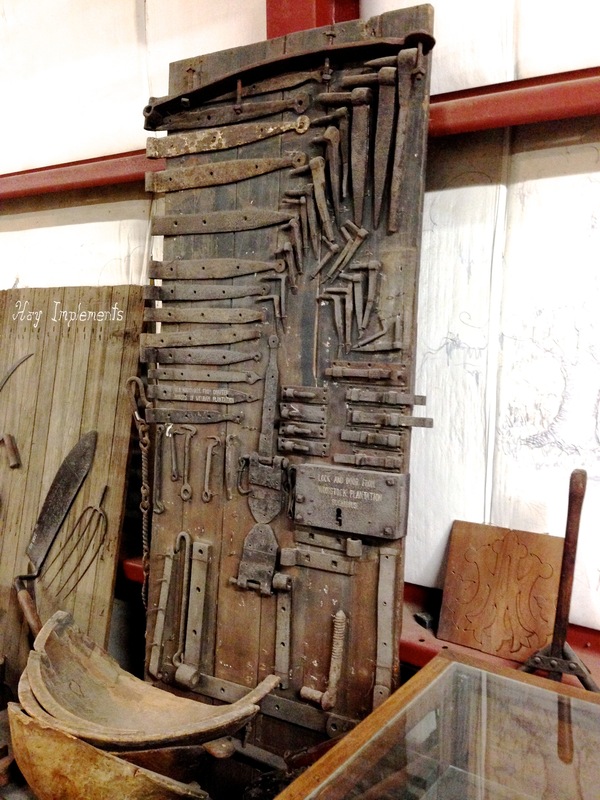 Click HERE to see all 35 pictures from the LSU Rural Life Museum. 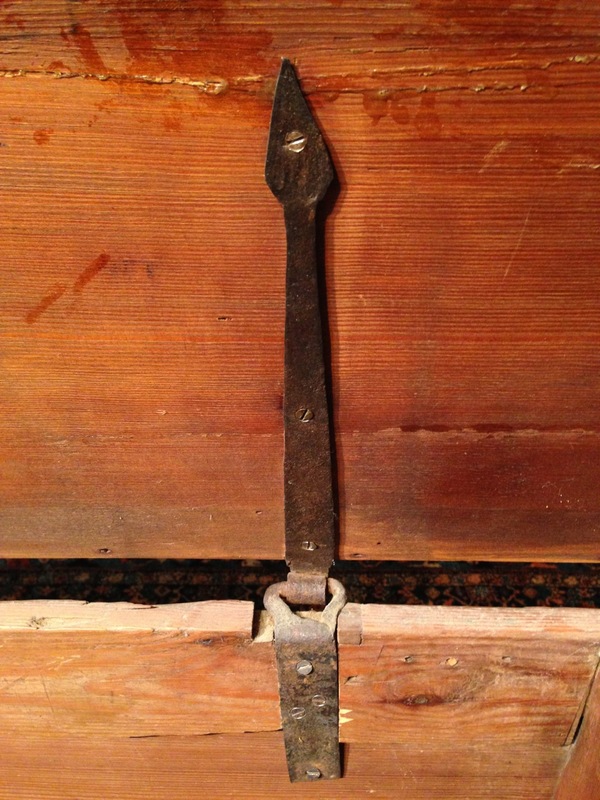 A different hinge from the past. Well, May. Not something for sale at most stores. 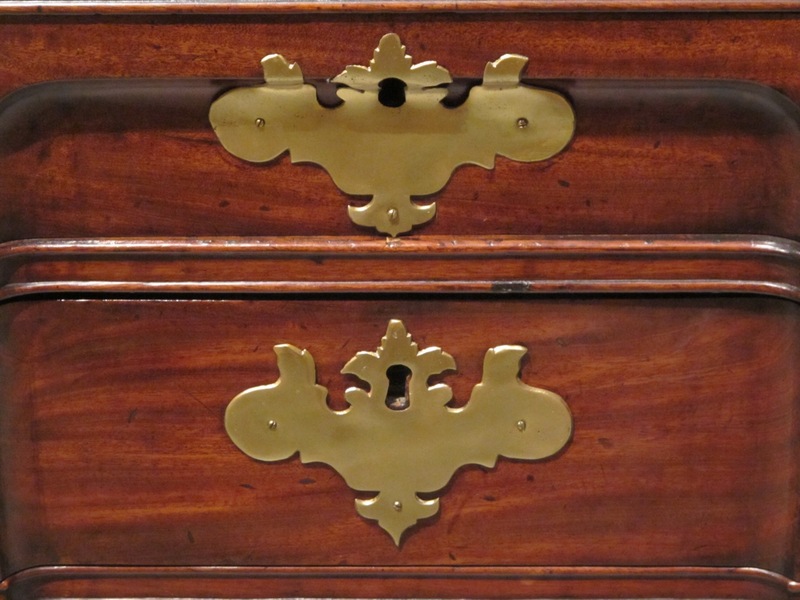 A conventional chest with a unique hinge. I amazes me how many different ways there are to accomplish the same end. 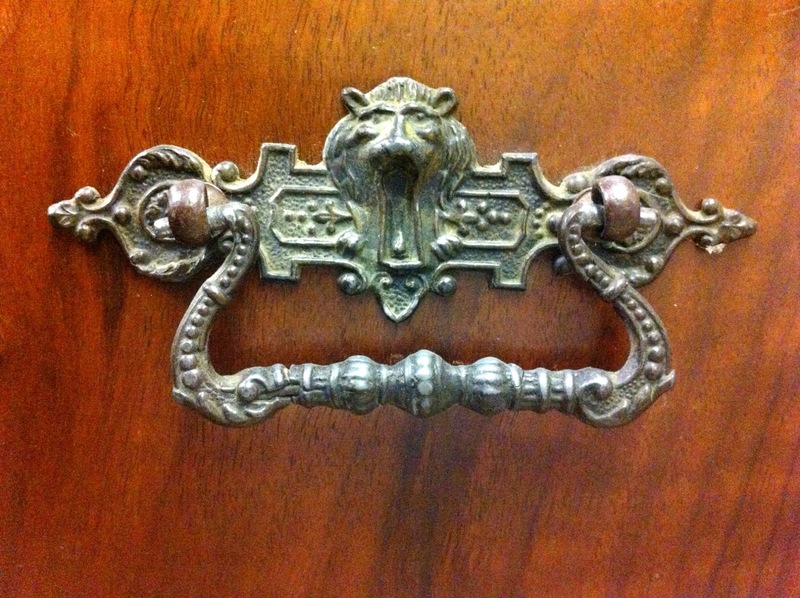 You can go back and look at my last different hinge post by clicking HERE.